Can Joel Stave's Arm Save Wisconsin's Offense? Prior to the Iowa game, I had hoped to publish an article this week seeking an answer to the question of whether or not Joel Stave was actually showing signs of improvement in his senior season. After the Iowa game, however, I sincerely doubt any Badger fans are still of the opinion that spending last offseason with “quarterback guru” Paul Chryst has suddenly transformed Joel Stave into the second coming of Russell Wilson. You turn the ball over four times, you've had a bad day. 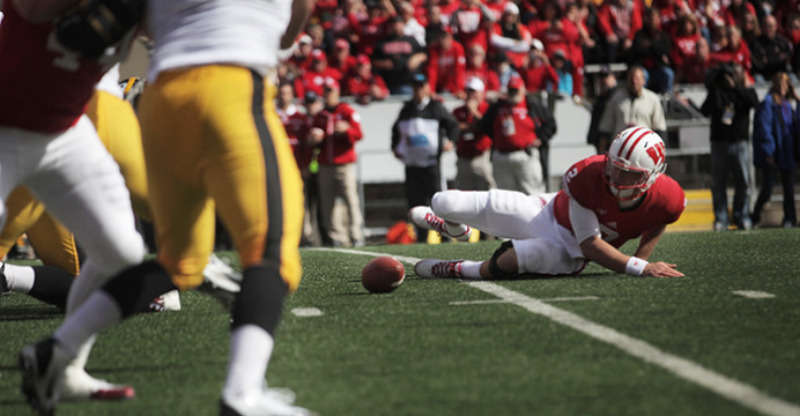 But a deeper look at this past Saturday shows just how ugly it was and points towards some troubling signs for the Badgers’ primary pass-thrower. Stave’s line, on the surface, doesn’t look too abysmal (21/38 for 234 yards, no TDs, but 2 interceptions). That’s good for a 55% completion percentage and 6.2 yards-per-attempt (Y/A) – not great, but better than most non-Melvin Gordon-fueled rushing attacks, and probably good enough to win in a low-scoring game. It’s actually even better than Stave did against Alabama in week one, where he tallied only 5.8 Y/A. Unfortunately, those numbers do not account for scoring plays, turnovers, or sacks, which are all crucial components of quarterbacking. Adjusted-net-yards-per-attempt (where the “adjusted” provides a +20 yard bonus to touchdown passes and a -45 yard penalty for interceptions, and “net” accounts for yards lost due to sacks) gives a much better overall picture of the average number of yards gained per pass play. Stave’s ANY/A (adjusted-net-yards-per-attempt for the uninitiated) on Saturday: a meager 3.3 yards per pass. That’s bad, but it gets worse, because it doesn’t account for Stave’s costly fumbles, one of which took place on a designed pass play. Stave technically ran the ball twice: a three-yard scramble and a four-yard loss after being stepped on by his own offensive lineman (which led to one of the fumbles) while attempting a handoff. Accounting for the scramble and the fumble lost on one of his two sacks, Stave ends up with 234 passing yards, 3 rushing yards, two picks, two sacks, and one fumble on 41 passing plays. Fumbles are actually given an even bigger penalty than interceptions in adjusted yardage (-50 yards instead of -45) because they typically happen closer to the line of scrimmage, resulting in better field position for the opposing team. Against Iowa, each time Coach Chryst dialed up a pass, Stave and the Badgers offense effectively moved the ball, on average, merely 2.0 (adjusted) yards. Going forward, it’s extremely doubtful Stave will have this poor of a game again. Thankfully for the Badgers’ offense, a four-turnover game doesn’t occur very often (and a fair number of football analytics studies have shown that turnovers are largely a factor of luck, anyway). As bad as they are, the bigger sign of trouble for Stave isn’t actually in his yards-per-attempt numbers (he has a serviceable 6.2 ANY/A on the season) but instead is found in his success rate. A low success rate doesn’t necessarily lead to a low-scoring offense. If the offense can pick up yardage in bunches with a boom-or-bust philosophy, it can still be effective by creating big plays (not unlike Melvin Gordon’s 2014 campaign, where he led the universe in runs of 10+ yards). Stave, though, is only averaging 11.5 yards per completed pass this season, a number typically associated with a “West Coast” style of quarterback that completes a high percentage of short- and medium-routes. This means that Stave’s successes aren’t all that big, or at least not big enough to make the threat of him passing the ball a very dangerous one. In order for Stave and the Wisconsin offense to improve their performance, Chryst will need to find a way to either increase Stave’s efficiency at throwing high-percentage short and medium passes in order to sustain drives, or otherwise attempt to stretch the field by going for the home run ball more often. Based on what we’ve seen of Stave and his receiving corps thus far, I’d say the former is more suited to existing talent on the roster than the latter, but neither will be easy to accomplish. Most of us expected to see a dropoff in Wisconsin’s offensive numbers following the departure of Melvin Gordon, but many hoped that the new head coach would be able to rejuvenate Stave’s potential and breathe some life into the lackluster passing game of recent years. To say that Chryst’s offense still has a lot to prove going into the heart of conference play would be a gross understatement. Posted in 2015 Season and tagged with Joel Stave. October 7, 2015 by Buckaround.